« What’s so special about Yeshua? For many years this was my experience. It could be described as being in a state is spiritual incongruence. Ones experience does not match up to ones self structure. As in all aspects of life we must strive to keep our locus of evaluation within. When we strive to please others or compromise to fit in, this leads to this sense of incongruence/anxiety/nausea. Great comment Simon – that’s why Self – awareness isn’t the enemy of faith as most Christians believe. When Paul teaches on ‘the flesh’ he’s referring to the survival-self, born out of rejection that’s completely out of kilter with the unconditional Divine Love that’s available for all of us as our source of genuine authentication. Without the internal synchronicity with the Divine we are like sheep to the controlled slaughter! At least that’s been my experience. These are tremedously insightful posts weaving mimetic desire into the gospel narrative and church experience. Very insightful. You know I’m a fan of Rene Girard as well, and I really appreciate how you are able to incorporate his theory into Christian experience. Thank you and keep them coming.. Thanks for the encouragement Darrin. I’ve found that no-one has really applied Gerardian thought to involvement within Christian community. It was a life saver when I met Roel Kaptein, one of Girard’s friends in the 80’s. He understood but I’ve found no-one else since then. Maybe there’s a book there for the future! I notice on your blog that you’re in Uganda quite often – you should look up an old friend of mine who’s now a living legend in Kampala – Dr Ian Clarke. If you get in touch tell him you know me and I’m sure you’ll get a visit to his lovely home!!!! Have you read my book The Prodigal Prophet at http://www.authonomy.com? It’s full of the pitfalls of mimesis within a religious movement. oh my gosh, you just solved a fifteen-year-old mystery for me! Thank you! Glad something has sparked within Tana. When I first saw this 25 years ago it was scales falling off my eyes – I had been energized by my pastor’s metaphysical desire and not Holy Breath. One leads to subliminal rivalry and one leads to perfect freedom. What? You too? I feel at home here amongst kin folk. John Sanford writes in his work The Kingdom Within, “By instinct, man is a group animal. For hundreds of thousands of years he has existed through the group, and the individual has found his identity and meaning by virtue of his inclusion in the tribe, clan, or nation. A wonderful comment Debra. I love the quote. The mimesis within the group is extremely powerful – just try leaving one that you’ve been involved in for many years. We all fear becoming the group’s scapegoat and the ‘psychological death’ that this entails. Only Spirit energizing Will can spring us from the network of desire. After many many years I finally figured out that the reason I didn’t feel close to God, was because I kept bumping into the people whose faith I was trying imitate. My eyes were fixed on people, not on God. Love the mention of spiritual incongruence, Simon. My goal for a long time has been to become more and more congruent; to trust the voice within. All that is not love and life, has no place in me. I love that last paragraph. I tend to think something is really wrong with me. There is actually something GOOD going on inside me when I leave feeling worse than when I got there. Good to hear that explanation. I hate it when I am in church and feel like I’m being held hostage. Julie thank you for your most honest and perceptive comment. I’m so glad the post resonated with you Julie.I believe many of us have or presently do feel like this having attended a religious meeting or service. It reminds me of the Emperor’s New Clothes – everyone pretending that there’s something very special going on – especially during the sermon – when we are in fact allowing ourselves to sit under the cosh of the Desire Matrix. My own advice would be to stop going if your internal warning bells are regularly set off on Sunday mornings. Go for a wee walk in Nature and FEEL the difference. The larger the group the more acting that goes on amongst the people within it. The less sincere the prayers and the less genuine the faith. 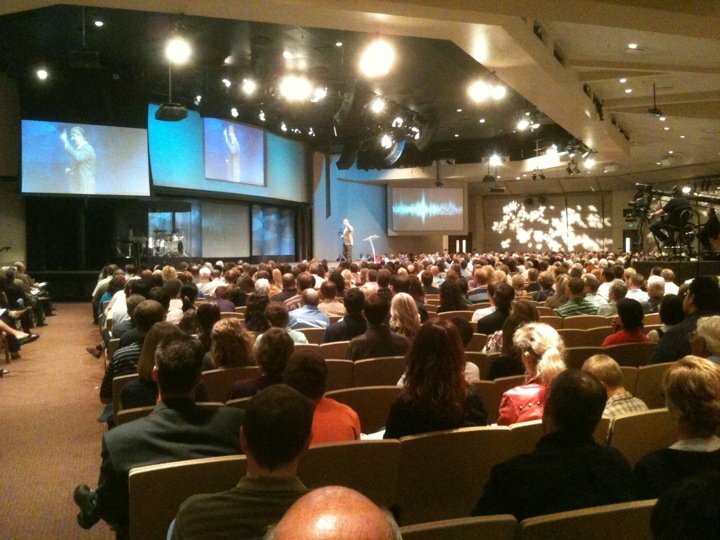 The idea of these mega mind numbing churches was not in any way the desire of Jesus or his followers. They wanted exactly the opposite. “For where two or three are gathered together in my name, there am I in the midst of them.” How on earth can someone even remotely experience a oneness with the Divine if they are amongst many and listening to someone who is paid to preach in whatever manner he/she chooses? When Jesus prayed to God (note, he was not God himself – would be awfully silly to ask yourself for help and strength now wouldn’t it?) he went alone and somewhere within the creation like a garden or mountain. He taught to pray alone, not with a group. You don’t need a church filled with people. Your mind is your church. I’m right with you Nelson on the large mega church type thing. In my experience the performances aren’t just on the stage but within the congregation as a whole. We play our own roles in such a setting, even if it’s just by a beatific smile or a nod of the head followed by a heart ‘Amen’. Girard claims that the more charismaic a preacher orator the greater the gravitational desire pull. This also applies to the size of the group that one belongs to – the greater the desire mass the more difficult it is to resist the mimetic field. Like you I believe the only truly sacred space where the Divine meeting takes place is the chamber of the heart; the meeting place of restored psyche/spirit. All other external experiences are the icing on the cake. So being a hermit just means you are kicking it with God. Its not about being a hermit Stacie, Its quite often about spending time with God quite alone sometimes for a period of time to answer some serious questions you can no longer just bypass anymore. For me anyway it became so hard to ignore the things I felt and saw and needed to have time with my daddy to heal and come to terms with them. For me I have learned to rely on him alone now first and foremost, without the ‘need’ for others. But theres a different kind of need I have, a functional need for fellowship. One where I trust Holy Spirit to bring those individuals intp my life and across my path who I can touch base with on various levels. My Spirit actually craves this. I actually felt more of a hermit in the corperate church setting always. I personally never had my deep spiritual, physical, emotional love needs met. I always felt alone and like I didnt fit in. I wasnt one of the popular ones. Because I was a single mum with a special set of needs. I dont believe one community of people are equipped to meet the needs of everyone. I believe God hand picks people for the role of helping and coming along side another. Buut first and foremost one needs to know he is able, not a hall for of people. Because a humans needs are to intricate to limit them like this. When i left the building this opened me up to a whole world of potential friends. God hand picks them for me across the globe. And yes much is online. But I also have travelled and met with some special ones. And yes I enjoy kickin with Jesus too. I dont believe the church structure is right for everyone. I dont know how it can possibly be for anyone to be honest. But if it is for you then thats qhere you need to be. Finding the Kingdom of God being within is what began to change my whole view on the need for fellowship via a church building. Submitting and authority are amply covered when you know you are in Him and He is in you. He can truly take care of all your needs… I still visit buildings from time to time and watch God work in spite of the confusion:) but I find it best to rest in what He says He has already done. Thanks for dropping by Sheila. Yes my own experience reflects your own. Once one is really aware of the indwelling Presence of Spirit knowing that it is there for good the need for religious ritual is greatly diminished. I’ve discovered that the best form of contact with others who walk the same Path is outside a formal religious or spiritual setting. It’s not the I’m against going anywhere, religious building or otherwise, it’s just that the narrow track of status quo, predictable religious services do nothing for me, nor I believe, most folk there. I have seen this in practice in my younger days. I remember watching the interplay but not being affected. It made me a target from both the leaders and the flock. Hope it helps Sarah. Many are trapped but see no way of escape. Leaving ‘church’ seems so like leaving God, but it is thankfully a lie. There’s a big world belief that if the church doesn’t prosper and go forward that the particular sect will be lost. Well, so what? As you say, Dylan, we don’t need to relate that way. The church is a human institution, that’s all. And actually, as you’ve hinted, we have to watch that we don’t get caught up with just one person, too…a mentor, for instance. Very easy to slip into the trap that he/she is wiser than we are, and so we try to model ourselves after him/her. I’m finding that some of my best spiritual relating happens on the internet. I loved this remark: “…like bible carrying zombies in the night of the dead.” Oh, and the blood-sucking vampires one was pretty good, too! Thanks for commenting Amy. Gosh I wrote this Post over a year ago. Must have been around Halloween with all my sppoky imagery! Yet it’s been my most viewed post. I guess it must hit some desire nail on the head of us past or present pew observers! Thanks for dropping by Dennis. I believe that within any group of religious or spiritual folk we must relate out of freedom. At times ‘giving back’ to the group is just part of the rivalry system, that digs us in deeper to the approval game with others.It can be a spiral of sorts that only intensifies the feeling that something is wrong. Anyway that’s been my own experience. A very brief comment. We can all, quite easily, find fault in Christian Churches, as well as in other Religions, and that may be as it should – unless we have completely uncritical minds, even re. important issues. But to accept, unquestioning, anything is not very smart. However, could there be any Positive messages in Religious teachings. Should we be careful not, so to speak, throw the Baby out with the Bathwater ??? Thanks for dropping by and comenting on my wee post. I guess I agree the Baby is to remain whilst the bathwater may or may not be dispensed with. I guess it all comes down to how we define both. For me the Baby is the Divine spark within that is independent of religion and its organisational structures – such a spirit essence is a deposit of Divine Love itself. It is to be experienced rather than passed on through doctrinal teachings as such. Indeed, religious teachings with their emphasis on conceptual belief may in fact cloud the Light of the Spirit within our psyche-souls. As you say we can all find fault within the organised and also unorganised groupings associated within religious traditions, and I would suggest, it is impossible for us not to, for they can and do easily morph into the transferrance matrices of skewed desire of which I spoke in the article. Hope that clarifies where I’m coming from. For years I thought I had the problem. I stopped going to church about 12 years ago because I always felt worse coming out than going in. Not to mention I thought I was the one with the problem! Thank you so much for this Rticle Dylan–it makes so much sense now. I haven’t been to church for a long time and I know I still haven’t ridden myself of some bitterness but it’s a work in progress. Why go to Church at all, if it makes you feel worse ??? It’s supposed to be, isn’t it, for the purpose of healing your mind, perhaps even to bring about some harmony in life. If not, then Church may not be the answer for you .Although some people, through their religious upbringing, might feel that not attending Church is Sinning against God. I remember once having a thought that an orchestra can be in tune with the conductor and each other but out of tune with God. Love this writing. Thank you. It sums up exactly the dynamic of what takes place in a meeting an organisation. Yes indeed. Moving as one in a religious or esoteric group setting may just mean that mimetic imitation is doing its thing, with the desire flow proceeding out of the leader of the gathering, be he/she a pastor, priest or ‘worship leader’! A sense of flow may not necessarily emanate from Spirit Breath or Presence. Thanks for your perceptive wee thought! Well this bible if you seek God with all your heart you wil find him. Spend time lots read his surrender all being to him only befor you knoe it you will be the one carry the power.Dont look to man seek God turn off the TV turn worship turn off negative turn on everthing that turns you towards him.Thats what I do but at the same time thats what his called me to. Indeed Nancy. We carry the Divine Voice within, even better a spark of the Divine essence. I guess the trick is to be naturally spiritual without being fanatical about it. When we are things flow much more easily and we are at peace. I have attended church for years and I did grow, but after awhile I would get that feeling after awhile and always thought it was “to much pride” or conviction. I now know it was Holy Spirt alerting me of religious spirits. I do love praying with and worshiping with people, so we started a meetup group and so far, it is going well. There are others out there with the same experiences. Thanks for this. Hi Sharon. Yes, we tend to ignore our gut instincts in religious settings, misinterpreting them as the the rantings of ego. Often they are the warnings of spirit to remove ourselves from the toxic environment ASAP. May your wee home group continue along the road of authenticity and genuine compassion. Jesus loved the church and gave Himself up for her! Food for thought! !